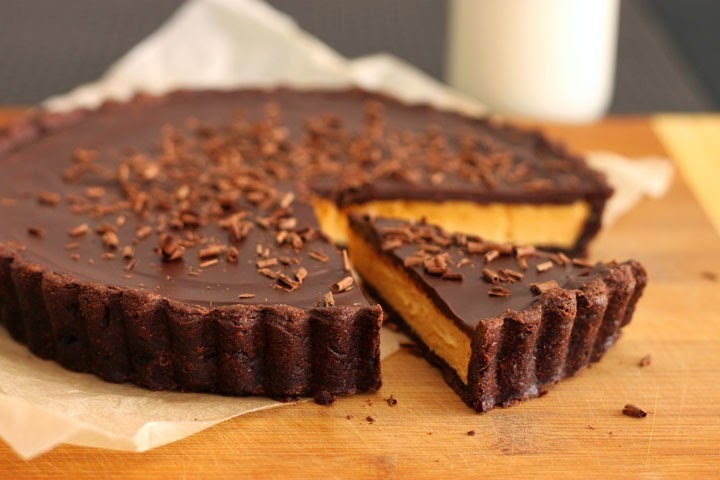 20 weeks is FAR too long to make you wait for a chocolate & peanut butter recipe, so this is well deserved and well desired. Back in January I posted Chocolate Brownie Peanut Butter Pies and I felt they needed a follow up. Those were small size hand pies - peanut butter cream cheese filling sandwiched between two fudgy chocolate biscuits. 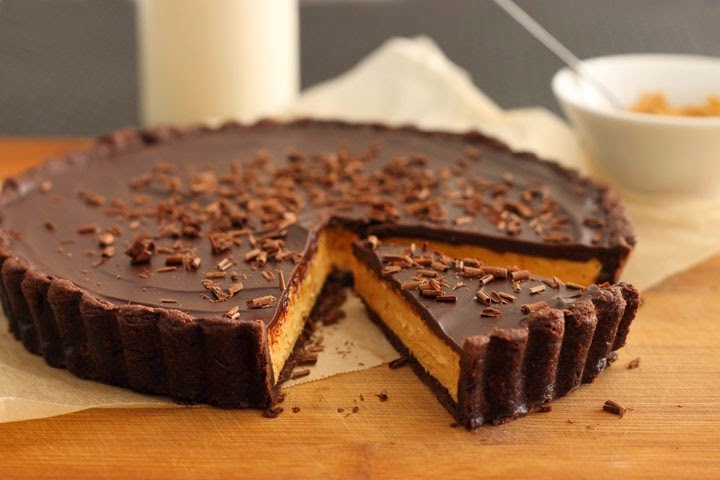 Today I'm thinking big - I'm dreaming of one giant Reese's peanut butter cup! One big round chocolate pastry shell filled with creamy whipped peanut butter and topped with a cracking chocolate coating. Imagine the journey your fork will take... First it will require some force as it breaks its way through the snappy chocolate shell. Once it breaks through, it plunges into a soft creamy pool of peanut butter. Then it will sink towards the bottom to encounter a crisp buttery cookie-like crust. Get ready for a world of textures and the king of flavour combos. Making chocolate pastry isn't much different than making standard sweet pastry or "pâte sucrée". The technique is mostly the same. The difference lies in the ingredients. When putting cocoa into recipes, it needs to displace another ingredient as it contains carbohydrates, protein and fibre. It contributes some structure building properties and dries out the batter or dough. However, it doesn't have the magic of gluten and cannot create the same textures or provide the same thickening power as wheat. The proportion of flour and cocoa needs to be carefully modified to maintain a healthy balance. In some chocolate pastry recipes I use a whole egg to provide extra protein structure, but sometimes that can dilute the chocolate flavour. In this recipe I bump up the protein with an extra egg yolk. The trick is that yolks also contribute fat and a powerful emulsifier called lecithin that can make the pastry too crumbly and soft. To compensate for this, have caution with the butter! Often I see pastry recipes with an uneasy amount of butter. The beauty of pastry is that it is also snappy and crispy - not so short that it can't hold together on your plate. Just 6 tablespoons is enough to help this cocoa-laden dough come together. 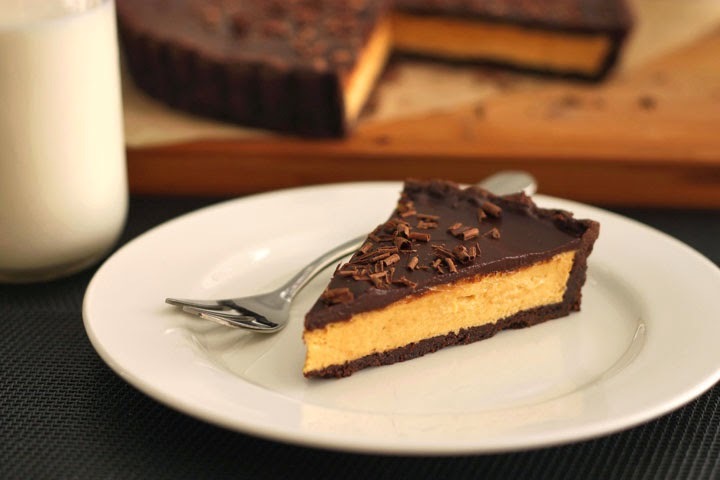 The filling is a whipped, creamy, buttery, peanut buttery mixture lightened with a bit of cream. Yes, butter, peanut butter and cream! It's beautiful. To give it that Reese's cup feel, we need a hard chocolate coating. For this, we melt together dark chocolate and butter. We're after a thick hard-crack layer of chocolate, but not so hard that, well... it's too hard. So a bit of butter helps to reduce the melting temperature and soften the chocolate just a tad. To make the crust, combine flour, cocoa, sugar and salt in a large bowl. Rub in cold butter with your fingertips until the mixture resembles coarse crumbs. Combine egg yolks and water in a small bowl and then add to the flour mixture while stirring briskly with a fork until it forms clumps. Bring the dough together with cupped hands to form a ball, flatten into a disk, wrap in plastic wrap and chill until firm, at least 2 hours. Preheat oven to 375 degrees F. Roll the pastry dough between two sheets of parchment paper to about 1/8-inch thickness. Gently transfer dough to an 8-inch round tart pan with removable bottom. Press and fit the dough into the tart pan, trimming away any excess. Chill the tart shell in the refrigerator for 20 minutes. Line the chilled pastry shell with a piece of parchment paper and fill with baking beads or dried beans. Bake for 18-20 minutes or until the pastry looks dry and set. Transfer pan to a wire rack to cool completely. To make the filling, beat butter, icing sugar, vanilla and ¼ cup of peanut butter until smooth. Add remaining peanut butter and beat until combined. Beat in cream, one tablespoon at a time, until smooth and fluffy. 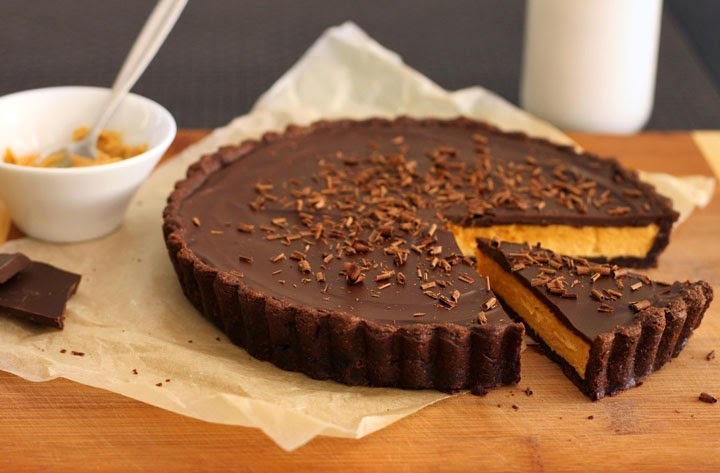 Spread this peanut butter filling evenly into the cooled tart shell and then transfer it to the fridge for 30 minutes to set. 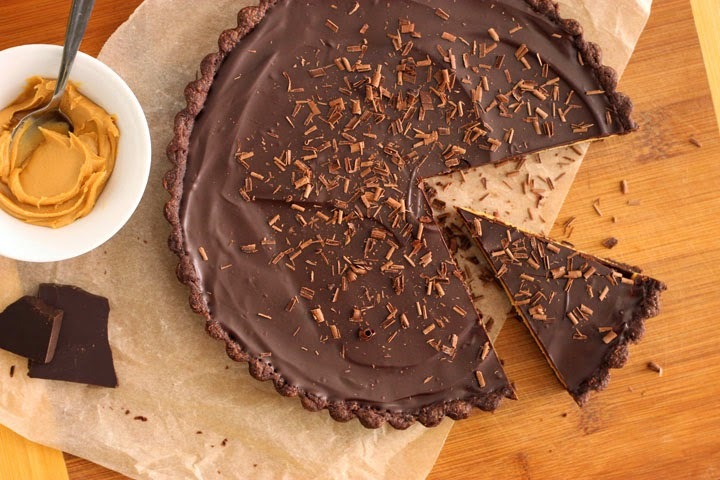 Gently melt together chocolate and butter in a small saucepan over very low heat (or in the microwave) until smooth and then pour it over the tart while still warm. Spread it out evenly and let set at room temperature (or chill until set if in a hurry!). Top with shavings of dark chocolate and serve at room temperature. It's best to slice with a hot dry knife to cut cleanly through the hard chocolate layer. Looks awesome. I can see myself making this with almond butter (due to peanut allergy). Almond butter all the way! Yousa........gotta do that one ! Thank you.